Synopsis: Maddie, Avery, and Nikki first got to know one another—perhaps all too well—while desperately restoring a beachfront mansion to its former grandeur. Now they’re putting that experience to professional use. But their latest project has presented some challenges they couldn’t have dreamed up in their wildest fantasies—although the house does belong to a man who actually was Maddie’s wildest fantasy once . . .
My take: The synopsis tells you everything you need to know – especially if this is your first experience with Wendy Wax’s Florida renovation series. I’m not sure if there’s a name for this series. I loved The House on Mermaid Point. The women find themselves intrigued and challenged by the new project on the private island. They’re all getting along better than ever which helps when it comes to tackling the renovation as well as personal issues. With each renovation project the women have experienced personal growth and become more confident. In this book, Madeline shines as she overcomes her shyness and reaches out to help the owner of the island, William. But will she be glad she took the chance? Deirdre and Avery (mother and daughter) are getting along better than they’d ever thought possible. Maddy’s grown daughter Kyra and her toddler son, Dustin, continue to try to ignore the paparazzi who hound them in hopes of getting photos. Dustin’s father is a famous film star that Kyra met on a movie project. Nicole is still in love with Joe but, given her two failed marriages, doesn’t want to marry him. On top of all they’re going through they are expected to reno the buildings on the island in a few short months – the hottest months of the year. I loved how Wendy Wax brought the women back together and through the project. Their television show is titled Do Over – and, to a certain extent, that’s what each of the characters is doing with her life. 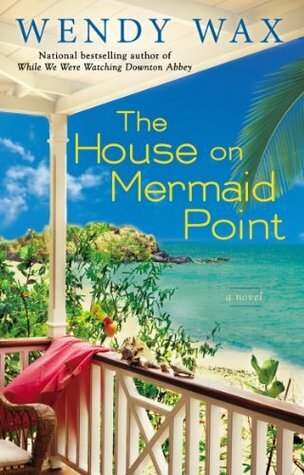 The House on Mermaid Point is an entertaining novel that packs an emotional punch and left me hoping for another Florida project for the women ASAP. If you haven’t read the previous novels in the series: Ten Beach Road; Ocean Beach; Christmas at the Beach (a novella) you won’t be lost in this book but I recommend reading them in order.